Our girls need more female representation in basketball! As it is women are not taken as seriously in sports as their male counterparts due to the difference in our physical make up. Basketball is a male dominated sport. WNBA players don’t make even half of what NBA players make and women’s basketball doesn’t have nearly as many fans. Not to mention, the grassroots level is seeing less participation which is causing the caliber of play to deteriorate. That again affects the sport negatively by decreasing fans. I believe the first step in getting women in basketball to be taken seriously is increasing the amount of women in superior roles. At both the grassroots level up to the professional level there are more male coaches than there are female coaches. Out of the 12 WNBA teams only 5 of the coaches are women. Even the WNBA’s former commissioner, Lisa Borders has stepped down and now the deputy commissioner of the NBA, Mark Tatum is overseeing the WNBA on an interim basis. Girls need to see women in those positions. How can we expect girls at the grassroots level to want to begin playing basketball, when across the board there’s no one for them to identify with. People in general, like to see people that look like them in roles they’re interested in. For a lot of people, this is confirmation that it is attainable. Who is going to take other women and/or girls more seriously in basketball, than other women who also love the game. I’ve been a high school girls basketball coach at my alma mater for the last six years and I played in high school 4 years before that. Within that time, I’ve seen a significant decline in participation. There were several games at the JV level that were cancelled because other schools did not have enough girls tryout. There were even games where we played a varsity team that hardly had 5 girls to make up a team. Imagine how demeaning and embarrassing it is to be a high school girl playing on an inexperienced team of five or six players, and you’re playing a more experienced team with double the amount of players, in front of your fellow classmates. Those girls aren’t going to want to continue to play. And this happens in the DC metropolitan area (DMV), which is known for developing top tier athletes, in both men and women’s basketball. 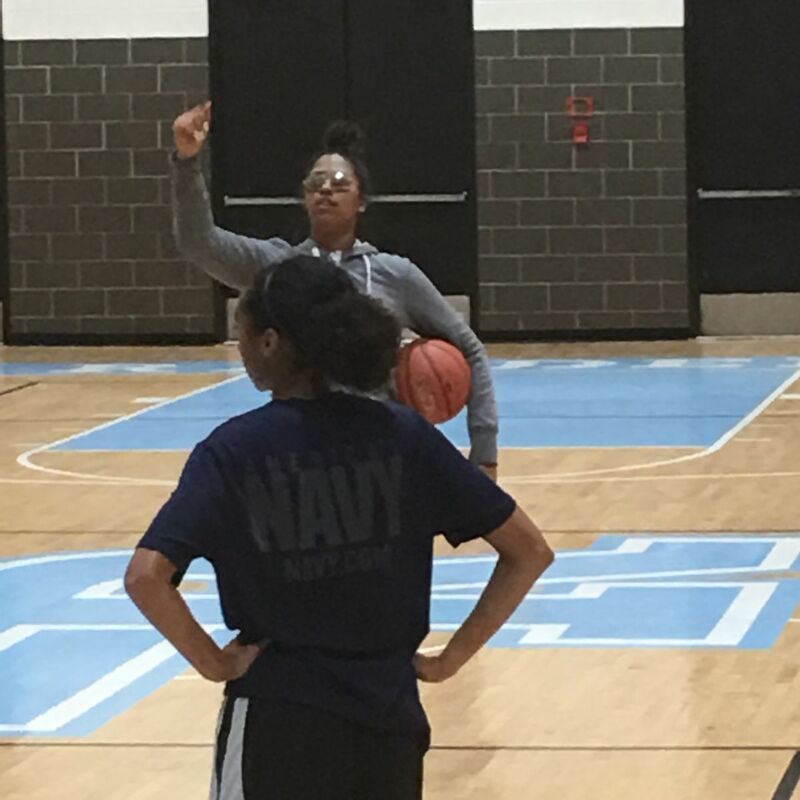 Just last Tuesday, January 22, 2019, the biggest game in girls basketball took place at Bishop McNamara High School in Forestville, MD. Two teams from the DMV were ranked among the Top 5 teams in the country! Bishop McNamara’s girls basketball team who was ranked No. 1 in the country before the game, played St. John’s College High School’s girls basketball team who was ranked No. 4 in the country. What an accomplishment that not only were both teams nationally ranked, but two teams out of the DMV area were ranked among the Top 5 teams in the country. However, the game was hosted by Bishop McNamara at their school, where the venue was clearly not large enough to seat the fans. Fans who could not be seated in the gym, yet paid to see the game were sent to the school’s cafeteria where they live streamed the game. As a player and as a coach I cannot tell you how often I’ve seen this happen. And as a woman in basketball I cannot tell you how much of a slap in the face this is. When elite boys teams play big games, the games are moved to a local university or simply another high school with a larger arena, so that everyone can see the boys play center stage. What message are we sending to girls? No matter how hard they work, we do not put them on the same pedestal. How many times have you been to a girls basketball game and the amount of fans in the stands doesn’t even fill half of one side of the court? I know in the past six years that I’ve been coaching at my high school, they don’t even let the bleachers down on both sides of the court for girls games anymore. However, for the boys games they do. Unfortunately, because of the significant deficit in fans between the boys and girls games this happens. Therefore, when these young ladies work hard on the court and in the classroom, rank in the Top 5 in the country, and then have the opportunity to play each other and represent for their entire area, it is a “historical event”. Instead of only seeing our young ladies as an opportunity for a school to make money, let’s give them some incentive. Let them know that they have done something big. Allow them a floor to showcase their talents in front of whoever wants to see them play; family, college coaches, other girls teams, etc. It was anticipated that the game would be over capacity because they set up another area for people to watch a livestream. I can’t imagine being a parent and getting turned away from the gym because there aren’t enough seats. This kind of negligence has to stop in girls and women's basketball, and in order to bring awareness and make that happen, there must be more women in these executive roles. Only women understand the hardships, first hand, that girls endure in sports! There is no one better suited than women to go to bat for other women. We need women to represent for women in basketball the same way that women represent for cheerleading, dance, volleyball, etc. Women’s basketball is completely glamourous if you ask me! Women’s basketball is more fundamentally sound than men’s basketball, women display nearly all of the same capabilities as their male counterparts, and it is made of women who are mothers! It’s amazing that, as inferior as we supposedly are to men athletically, our bodies allow us to grow a baby inside of us for 9 months, go through labor and delivery, nourish our babies, and still get back in shape and get back on the basketball court! Women are powerful and women’s basketball needs to glamourize that!